WISELY 1412 is mainly used to cut many kinds of non-metal materials, such as Acrylic, Bamboo products, Cloth, Plastic, Marble, Glasses, Woods, PVC, etc. It can process the plexiglas products, acrylic display panel lenses, wood carving, wood percutaneousflowers, advertising products, crystal characters, packing boxes, models, toys, furniture and so on. 1. High Accuracy--HIWIN/PMI Linear Guide Rail from Taiwan. 2. Laser tube and power supply from www.recilaser.com , long life, perfect cutting/engraving effect and strong power. 3. Four kinds of table: Motorized Up/Down Flatbed Table, Fixed Honeycomb Table, Fixed Flatbed Table & Fixed Knife Table. 4. Online & Offline Operation: To transmit data from PC to machine by USB cable or transmit by Flash Memory Disk. 5. High Rigidity--The thickness of the machine body is 1.5mm, the shape of machine will not change within 30 months. It is specially designed for smooth and high-speed cutting. Working Table (DEFAULT) : Fixed Honeycomb Table, Fixed Flatbed Table or Fixed Knife Table. Machine Color (DEFAULT) : It is Black Red. We can paint the machine with your color if your order is big enough. Computer Required : Memory: 512MB; Hardware: 40GB, OS: XP or VISTA, at least one USB port. Optional Devices : Chiller, Motorized Up/Down Flatbed Table, Rotary Attachment, Automatic Focus, etc. 1. We use the high-precision Linear Guiderail imported from HIWIN or PMI in Taiwan. 2. 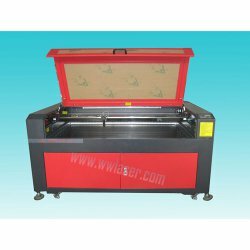 We use the best laser tube and laser power supply made in China, which is from www.recilaser.com. 3. We use the driver from www.leadshine.com which is the most popular manufacturer of driver in China. 5.5. Our machine adopts 3-ph motors from ww.leadshine.com, NOT 2-ph motors, it can ensure the machine to work more steadily and smoothly. 6. Three Softewares for your choice, you can choose one between the three. If you want to choose CDR or AutoCAD, you should install CorelDraw or AutoCAD at first, this system supports CorelDraw11, CorelDraw12, CorelDraw13, CorelDrawX4, AutoCAD over 2000 version. glycol (or Antifreeze) and water as the coolant fluid. Rotary Attachment with rollers--it can engrave on thematerial like bottles or cups.Rotary Attachment with clips--it can engrave on the material like wood, bamboo, cup and so on.